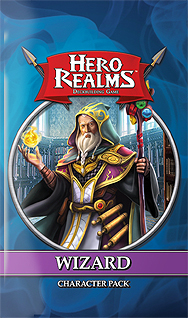 Play Hero Realms as a mystical Wizard. With your feline familiar by your side, summon forth scorching flames from your enchanted staff and lay waste to your enemies! Included are 15 cards: a Wizard character card, the Channel and Fireball ability cards, two unique score cards, and a new ten-card personal deck (Cat Familiar, Fire Staff, Spell Components, two Ignite, and five Gold).